If a real estate-related website needs a Map API for their mapping needs, or as an alternative to Google Maps API, Home Junction’s Geocode data can help. The real estate world was rocked recently with an announcement by Google that they were changing their plans and pricing for their Maps API. An API is an Application Programming Interface which is basically software code embedded on a website to feature a map or real estate market data such as school data or recent property sales. One developer estimated Google’s change amounted to a 1,400% increase in pricing. Who wants a surprise like that in the middle of the year? According to Google, the change was made after they combined their 18 separate Google Maps APIs into three packages for Maps, Routes and Places and merged their Standard and Premium plans into one. Many brokers and developers who work with real estate websites are not happy. One broker said the new plan could amount to an extra $5,600 a month in fees for them. We all know Google offers incredible services and works hard to maintain the best search engine in the world. We’re sure they had their reasons for the change in plans. Price – the pricing for our Geocode data is one of the best in the business. Give us a call to find out. Usage – Home Junction also allows a large number of requests per minute. We think the most generous in the business. In addition, our geocoding can be used with any base map and we allow caching. Performance – need speed for your Map API. We’re fast. Very fast. Accuracy – Home Junction drills down deep with our data assets. We have parcel boundaries for most of the nation. We coordinate delivery address lines, street names, suffixes, zip codes, census tract data, neighborhoods, subdvisions and geographic latitude and longitude coordinates to provide a highly-accurate map feature. Bottom line: we are the Geocode data experts. We have geocodes for nearly 160 million delivery points combining data from both the United States Postal Service and other sources. Best thing to do is call a Home Junction representative for a demonstration on just how our Geocode API can fill your mapping needs. Google’s Map API was sort of a one-product-fits-all that developers would then work around to fit their client’s website whether it was a small business, bank, restaurant, tire store, etc. But Home Junction’s Geocode data was developed with the needs of real estate brokers and agents in mind. For one, our geo-spatial map widget can be integrated with local MLS listings. This is huge. A broker or agent can show a property or several properties on a map at one time. Secondly, Home Junction can integrate that map and those MLS listings with critical neighborhood information. Boundaries – municipal, school and tax. School district and attendance boundaries are incredibly important for families with children and to show the enhanced value of any property. School data – enrollment numbers, student/teacher ratios etc. Parents want to know the location of a school in relation to any property they are considering. Demographics – an overview of the community in terms of education, income, etc. Local amenities – our Geocode API can also display the location of parks, golf courses and other places that add value to a property and move a property up in the mind of a buyer who enjoys certain amenities, say parks or golfing. Local businesses – perhaps a home buyer likes yoga. Home Junction’s Maps API can point out the local yoga studios and their approximate distance from a property. Neighborhoods sell. Home Junction’s SpatialMatch widget helps you illustrate the power of those neighborhoods in a convincing, visual format. Transportation amenities – people are driving further and further to get to work or busing their kids around town. Point out the major highways or train stations to show the benefits of a property. That alone could a major influencing factor. Don’t just tell a prospect there are great schools, or parks or bus stations near a property. Show them. Home Junction also has a full complement of other APIs to include with their Maps API. This is super important as well. As a broker or developer, you don’t want to bounce all over the web trying to find different sources for different APIs. Not only that, but you never know how those different APIs from different companies will interact with each other. A bunch of software code over here can have an effect on a bunch of software code over there. Basically, thousands of datasets for different key pieces of information that every home buyer needs to know. 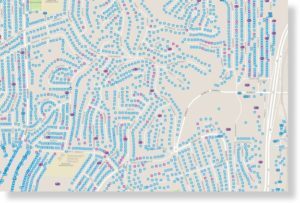 Another great advantage is that Home Junction can sparse this data down not to just the county or city level or even zip codes, but all the way down to neighborhoods and subdivisions. This truly gives buyers an in-depth, focused picture on the home and neighborhood they are considering. (And conversely, data that every seller would love to see used to promote their listing. For example, say Property A is located in an area with a great school with an appealing student/teacher ratio, with home prices that are steadily trending upward followed by a chart on recent sales activity also moving higher. A seller will love to see all that information provided alongside their listing). By adding Home Junctions Maps API, a broker is also opening a window to so much more real estate market data than can be embedded on their website. Sure, Google’s Map APIs product was nice when it was free or super-cheap. But as we know, things change. It’s time to change to Home Junction’s Geocode data built specifically with real estate websites in mind (or real estate related companies such as banks and mortgage companies) and integrate a geocoded platform built to optimize the value of property listings.